Eating Disorders Coalition Advocacy Updates: Add Your Signature! Disney recently recreated its most beloved classic cartoon characters for an upcoming holiday promotion for Barney’s Department Stores. 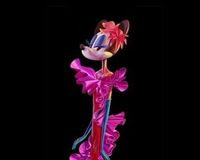 In the new ads, Minnie Mouse, Mickey Mouse, Daisy Duck and Goofy are all at least 5’11 in height, and are strutting sexily down a Paris Runway wearing clothes designed by Dolce & Gabbana and other high-end labels. Their limbs are gangly and their bodies have no shape. These new characters send a terrible message to young children reinforcing an already prevalent attitude that you have to be stick thin to be stylish. Every day, children are inundated with unhealthy media images encouraging them to aim for unrealistic ideals of beauty perpetrated by corporate marketing machines. This has ultimately led to a nation of people with eating disorders such as anorexia and bulimia. Please tell Disney NOT to allow these beloved characters to be used in such an unhealthy manner!